It’s hard to believe how long it’s been since Ni no Kuni: Wrath of the White Witch came out on the PlayStation 3. It originally released in Japan in 2011, finally getting a stateside release in 2013. Despite the long wait for the Western localization, it earned a number of accolades from English outlets that year, including our own RPG of the Year for 2013. When the sequel was announced, there was both an excitement and a wariness surrounding the title. 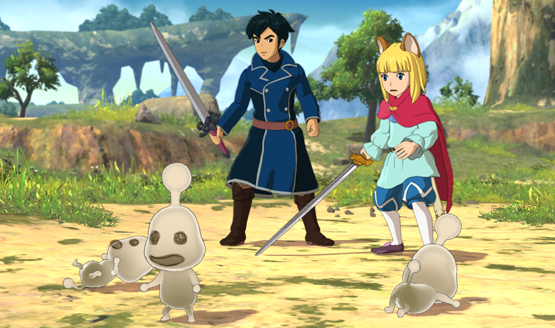 The more information that was released, the more it seemed like Ni no Kuni II would be a shell of the things that people most liked about the former game. At least that’s how I felt. I was a skeptic. I thought the visuals looked fantastic, the music sounded wonderful, and the story had heart, but each new trailer had me missing Oliver, Mr. Drippy, and the familiars more and more. I’d played the game briefly at E3, but still wasn’t quite convinced. This week I had the chance to play more than three hours in the early parts of Ni no Kuni II. While I’ll still miss my favorite characters and collecting the familiars from the first game, I’m now convinced that the sequel has what it takes to live up to the lofty legacy of the series. I was told to think of it like Final Fantasy when I asked about the drastic changes, new gameplay systems, and unfamiliar characters and locations. There will be some crossover elements, themes, and maybe even an Easter egg or two, but–unless they were misleading me about the narrative on purpose–Ni no Kuni II is as separate from the first game as Final Fantasy X is to Final Fantasy VIII. It feels better that way. The absence of familiars, the inclusion of the new higgledies, and the different version of Ding Dong Dell don’t have to stand on the shoulders of the first game to prove themselves. The development team had a lot more freedom to really make Ni no Kuni II its own game without any firm anchors holding it to the first. I was first struck by the incredible visuals. The first Ni no Kuni had a distinct and incredible style in 2013, but five years has given the development team some time to really refine it and take full advantage of current generation technology. There’s still that certain Ghibli style, but Ni no Kuni II seems to have found its own style as well. The backgrounds and environments have a lot more fidelity, making the bright cartoony characters really pop against any scene they are in, and for good reason. The early part of the game that I played had a lot of new faces, like Boddly the Goldpaw librarian, and the mysterious and bizarre Professor. 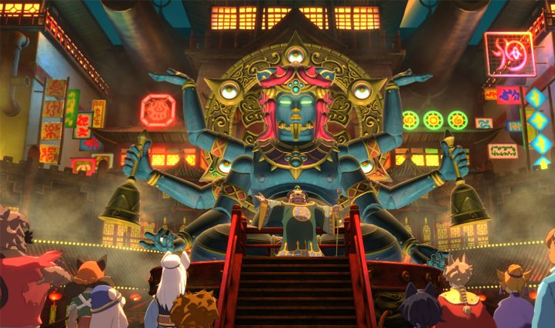 Ni no Kuni II’s characters are all a colorful delight with distinct and memorable personalities and visual styles. That seemed to be the theme of my time with the gameplay. Anywhere I had concerns about the game lacking depth on the surface, there was an answer for it. Combat was one of my primary concerns, with the loss of familiars. I feared the higgledies could never replace them. They offer a very different role in battle, and Evan takes a much more direct route than Oliver did by participating in every single fight personally. What I found was a system that is designed to be different and yet deep in its own way. The tactics tweaker allows for customization of combat and creating a variety of “builds” for different situations. Bright colors and bold shapes make up the UI so that it’s easy for players to understand, despite having the depth of any RPG. You can adjust sliders for combat rewards, choosing between either gold or experience, loot or items, gold or loot, etc. You can adjust parameters for damage against various enemy types, resistances to elements, and a number of other options. There’s always a catch though. The tactics tweaker is a set of either/or sliders, meaning you can’t have your cake and eat it too. If you’re having trouble during certain fights, this menu is exactly where you’ll want to be, figuring out how to adjust things to gain an advantage. Similarly, gear offers a bit of customization and character enhancement. Then there are the higgledies. These small creatures are made up of the elements, and you can have four “equipped” or in your party at any time. You won’t control them directly, but collecting and leveling them up will allow higgledies to provide unique support on the battlefield. Occasionally they will gather together and allow the player to perform a super move with them, which varies based on their type. Again, this is another level of depth and customization in the game that adds to combat and is run through the Kingdom Builder. As I kept finding, all of the gameplay threads are connected, and if I tugged at one, I was sure to sooner or later end up at another. All of this doesn’t even touch on things like Dreamer Doors (Dark Cloud inspired dungeons that get more difficult the further down you go) and Skirmishes (tower defense meets real time strategy meets Pikmin) that I only got a brief look at. Three hours may seem like a lot of time with a game, but as I was quick to find, it was just enough to prove that Ni no Kuni II is a deep and expansive game with myriad gameplay systems to keep players intrigued long term. My time with Ni no Kuni II was a magical experience. The sequel intrigued me with the name, hooked me on the visuals, and got me invested with its gameplay. I can’t wait to continue my adventure with Evan when Ni no Kuni II: Revenant Kingdom releases on March 23. You can check out some of my gameplay and additional commentary in the video above. 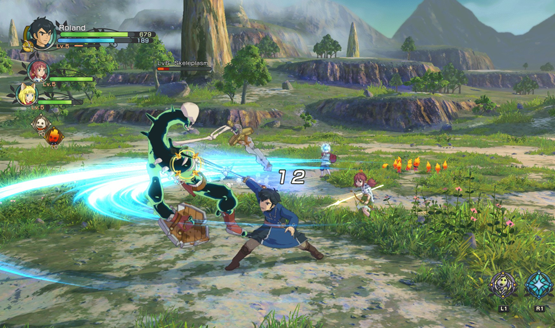 Ni no Kuni II: Revenant Kingdom hands-on gameplay captured at a preview event. Travel was provided by Bandai Namco.